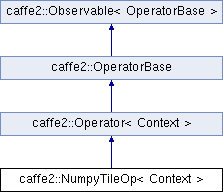 Definition at line 14 of file numpy_tile_op.h. How this works: Imagine a 2D tensor (matrix) of size 3x10, tiled 2 times. Tiling along axis 0 (row) means copying the entire 3x10 Matrix 2 times. outer_dim = 0, inner_dim = 30. Tiling along axis 1 (column) means copying each row 2 times, then proceed to the next row, until the end. outer_dim = 3, inner_dim = 10. Definition at line 22 of file numpy_tile_op.h.